Just 25 miles from the Napa Valley lies a 2.5 mile stretch of river called Putah Creek that lies below Monticello Dam. Below Lake Berryessa that provides a year-round supply of cold, clean water that Rainbow Trout need and love. I have fished most days of the year for over five years on Putah Creek and would love to teach you the art and excitement of fly-fishing. So if you enjoy the outdoors and want to try something new, give me a call! Half day (4-5 hours) for 1 or 2 persons - $325. Full day (7-8 hours) for 1 or 2 persons - $395. Includes rod, reel and flys for use. Some Wader sizes available for rental fee. Fly Fishing involves Catch-and-Release Method. Optimized locations on the Putah Creek, the Yuba River, and the Stanislaus River have been selected by Richard. Day fishing licenses must be procured by customer at https://www.wildlife.ca.gov/Licensing/Online-Sales. More than 72 hour notice is required to cancel, in order to be refunded your deposit. If a reservation is cancelled outside the 72 hour window of the reservation date, you are offered two options: 1) Use the full deposit as a credit that is valid for one year, or 2) Be refunded 85% of your deposit. 15% of the deposit is the fee charged for supplies already purchased and for the time blocked out on the guide's calendar. If a reservation is cancelled within the 72 hour window, your deposit is forfeit. Richard has been an avid fisherman all his life, starting at age 10 in West Covina, CA. He loved fishing so much that, before he had his drivers license, he would hitchhike up to Silverwood Lake or into Azusa Canyon, to fish for the day. His Mom used to tell stories of Richard's exploits throughout his youth as he tried all ways and means to go fish. He was turned on to fly fishing 9 years ago, by Bob Arwine at Sweeney's Sports in the Napa Valley. The minute he tried it -- on our local Putah Creek, in an old pair of Neoprene Waders -- Richard was totally hooked, literally. Since then he has easily logged thousands of hours fly fishing on his favorite local river, Putah Creek. He has also fished a few hundred hours on the Yuba River in Marysville, the Truckee, and the Little Truckee, the Feather, the American, the Lower Sac, the East Walker, the East Carson, the Pit, Hat Creek, and the Stanislaus River. 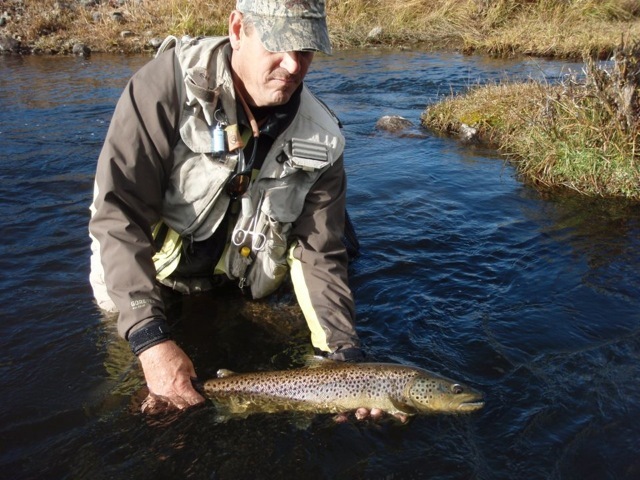 Richard also is a conservationist and has done volunteer service work with Putah Creek Trout, Department of Fish & Wildlife's Heritage Wild Trout Program, and served as a mentor for the Napa RCD's SLEWS Youth program. He has taken several classes at the Napa Juinor College towards an Environmental Sciences Certificate. His favorite, "Wildlife & Fisheries Biology,"" was taught by the Napa RCD's Dr. Jonathan Koehler. If you run into Richard on Putah Creek he will often be found with his rescue dog, Rusty, close behind. Richard will either be either be shouting: "WHOO-HOO!!!"" when hooking up, or cleaning up trash that others have left behind. Of his passion for fly-fishing, he says, "I would do just about anything to get a chance to fish; to stand out in a river and let my thoughts wander. It's the most peaceful place in the world to me -- the place I feel focused and free."